Today I am back with Blogging Tips, and we are talking about monetizing your blog through affiliate programs and sponsored posts - either through free products or paid posts. There is so much to learn - and I look forward to reading everyone's posts. Affiliate programs are a way to monetize your blog - by making money based on products your readers may purchase or click on. 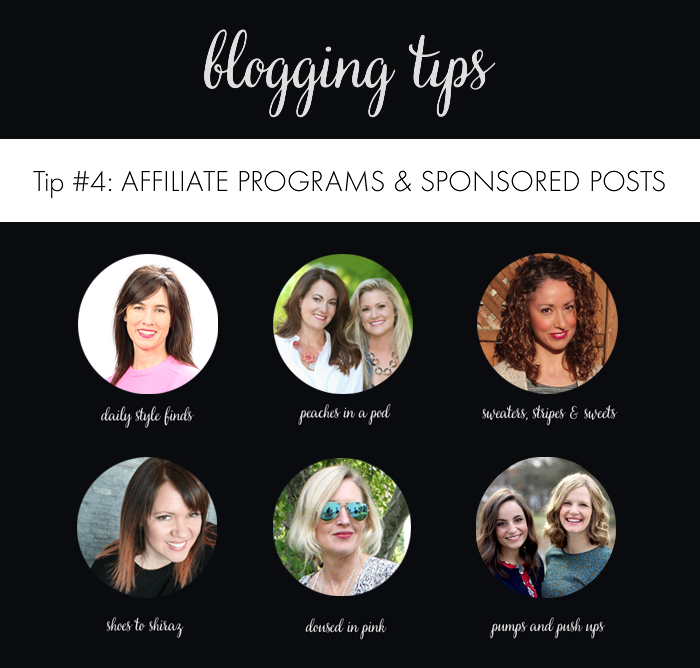 There are two major affiliate programs that most bloggers use - rewardStyle and ShopStyle Collective. Both programs work by paying a commission based off of products you have promoted on your blog; however, how you get paid commissions differs between the two platforms. rewardStyle pays based on purchase. So, if someone buys something you post on your blog - then you get paid a small commission from the total sale. ShopStyle Collective works by paying per click. So for every link you have on your blog that a visitor clicks, you get paid a small commission. For both, you have to earn $100 before you are paid, and then for every $100 afterwards. rewardStyle is an invitation only platform; whereas, ShopStyle Collective is open to anyone with a blog. A few years ago - all of the big bloggers were using rewardStyle; however, within the last year, several of those bloggers have started to switch over to ShopStyle. Depending on your traffic and engagement - ShopStyle may be the best way to go. With rewardStyle, you are competing with all the other bloggers that use rewardStyle, whereas, with ShopStyle Collective, you are getting paid as visitors click on your links. One cool thing about rewardStyle is that it has a great platform that allows for vistiors to shop Instagram posts. When you post an outfit photo on Instagram, you can link up all the items you are wearing. And, if your readers have signed up with LIKEtoKNOW.it and they "like" the post, then they will get an email with all the product information. I have included the steps in this post. As a blogger, you definitely are approached by a lot of brands - many of them wanting you to promote their business. Some will offer free products in exchange for promotion on your blog (and social media). Other companies will reach out to you asking for you to promote their campaign or company for free. I have never worked for free - and I do plan to work for free in the future. It takes time to create a post - and if I am creating a post specifically to promote another company, then I think it is reasonable to expect some form of compensation. I am also very selective with the products and companies I work with. I do not like promoting items or stores that I would not shop at myself. Also, every free gift is a tax liability, so I do not want to collect free products I do not want, and, then have to turn around and claim them on my taxes as "income". Most companies and agreements have specific terms for what they expect out of the partnership. Be sure to pay close attention to the terms of the agreement, so that it does not compete with anything else you may want to do. Also, it is important when you are working with companies to be professional in your correspondence. If they have a question or reach out to you, be sure to get back to them in a timely fashion and write a professional message. You never know what connections they may have - and you never want to burn any bridges. Some companies will offer to pay for a post. Some will have a set fee they will pay and others will ask what your rate is. For those starting out, a good formula for figuring out your rate is by your number of daily page views. You take your daily page views and divide it by 10 to get your sponsored post rate. I have limited experience in reaching out to brands. A little time ago, I reached out to one of my favorite brands. It was a long shot - but I had a proposal for an idea I had so I pitched the idea. I talked to a couple of people. It did not go anywhere, but I put aside my fear and reached out. My tip - is to take a chance. You never know what door may open and it is better to explore the opportunity than to sit back and wait for them to approach you. Also, when you reach out to brands, it is good idea to have a Media Kit ready in case they ask for it. A media kit provides statistics, such as your daily/monthly page views, followers on social media channels, rates for sponsored posts, companies/brands you have worked with, etc. Affiliate programs typically have coordinators that help to connect you with different brand promotions that might be a good fit. ShopStyle Collective talks a lot about building these connections, which is one reason I am intrigued with trying their platform. Hope this information helped. And, if you have additional questions - please feel free to contact me or leave a comment. Next, be sure to "hop" over to Marta to read her tips. These are helpful tips! You definitely have to be selective when companies reach out to you and I really need to create a media kit. It hasn't come up yet but I always wondered how much to charge for a sponsored post. Thank you for sharing the formula! Such a helpful post Lisa and love that's such a great formula for calculating your rate! Good for you for never falling into the trap of working for free with these companies! Love this series so much! I've had a media kit on my to do list for so long now. Love your equation for sponsored posts, I need to implement that (although I'd be slightly scared as to what it would say:))! It is so important to look at the fine print when working with a company! Such a great tip and one that we completely forgot to throw in there! Great post Lisa! Great tips, lady- and good for you for reaching out to a brand. It might now have panned out- but you never know what's right around the corner! Great tips. I'm loving all of these blogging tips you ladies are doing the past few weeks :) Keep them coming! I completely agree with the free posts. It's annoying to me when companies reach out and expect me to do all this work in exchange for 'social media promotion'. Um, no. They act shocked when I write back and ask for compensation! I would encourage anyone to stop doing free posts so more companies understand what bloggers are worth! Creating a media kit is on my to-do list so I'm saving that link you provided! Thank you! Once again I have to really commend you all for such a well-done series! It's so interesting to read everyone's experiences on these topics. The formula for figuring out a post rate is very helpful and something I'll be keeping in mind for future reference. And yes...companies that want something for nothing - pet peeve. I don't even respond anymore. :/ They're just not worth my time. This is so informative and helpful! I wish I had come across it when I started. I am so intrigued by the liketoknowit thing. How much time does it take to create an insta post for that? Great tips! Thanks for sharing! I'm really enjoying this series! Summer break cannot get here soon enough. So much I want to do. Have never heard of a media kit but sounds like a must for promoting your blog...kind of like a blog resume? Thanks for the sponsored rate formula. Hope I will need it soon.